If you thought that global carbon emissions were increasing linearly over time (roughly true) and that a constant fraction of them were retained in the atmosphere each year (also roughly true) then you would expect that the atmospheric concentration of CO2 would increase quadratically. 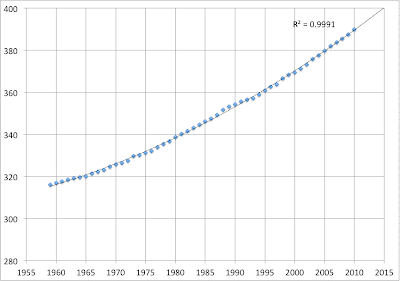 A quadratic fit to the annual Mauna Loa data is above and you can see that this simple brain-dead model explains 99.91% of the variation in the data from 1958 to 2010. Not often you see an R2 of 99.91%. If you were willing to assume that the coupled system of planet/civilization were to continue to behave in the same way for a few more years, then we'll hit 400ppm in 2015. For context, the pre-industrial concentration was about 280ppm, and I've made that the bottom of these graphs. Alex - yeah, that particular issue seems to have gotten a bit overblown to me - there's not much evidence in the global methane signal of anything super exciting happening. 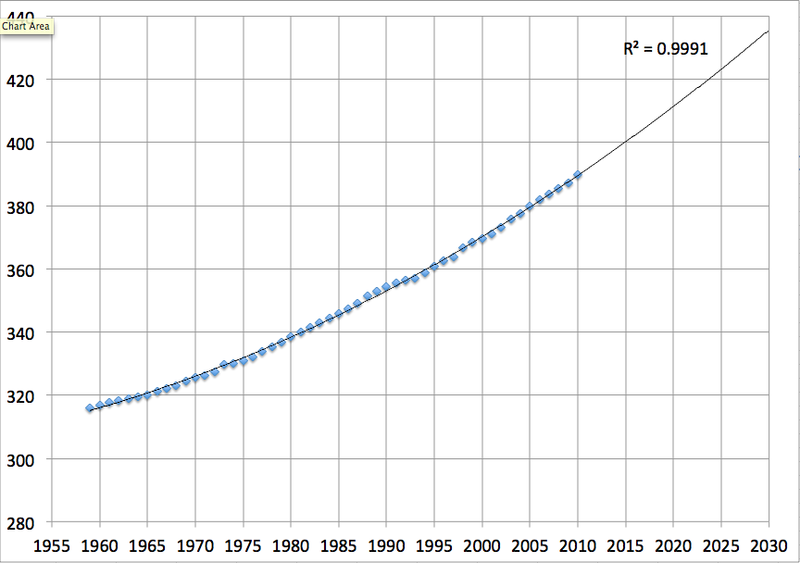 I think you "expect" exponential growth, hence exponential conc. Just out of interest, does an exp fit any better? I'm not so confident. There's been some recent news that present volumes of methane release are significantly greater than previously believed. yes, might be that it is overblown, but once the methane starts to (really) bubble out, what can be done to stop it? Re methane. Perhaps not overblown but just reaching the point where the ramp up of methane release will start showing up in the data. See..
for a very interesting article and comments on Neven's blog. The article has links to the actual research. 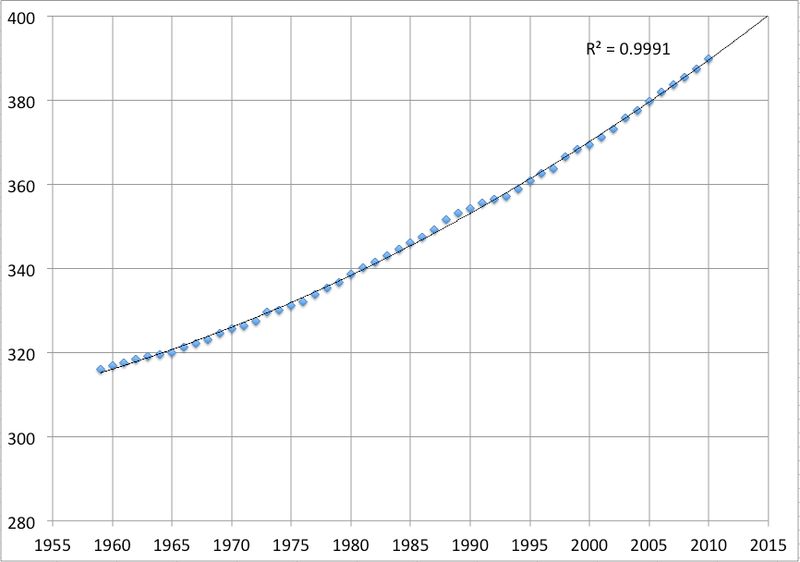 Isn't peak oil theory inherently antithetical to exponential or even quadratic growth in CO2 levels? Buck: my view is that we are in the zone of peak oil but nowhere close to peak coal. Stuart: That certainly makes sense with respect to CO2. My view is that Exxon Mobil is going to be right in their energy forecasts for crude oil and natural gas production and demand. 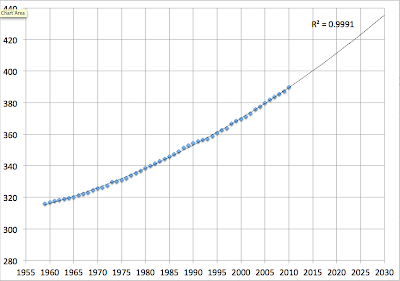 Exxon forecasts out thirty years and sees global liquids supply at 110 mbpd in 2040. In my opinion peak oil will only occur when some much cheaper energy source replaces it. I think that can only be nuclear.